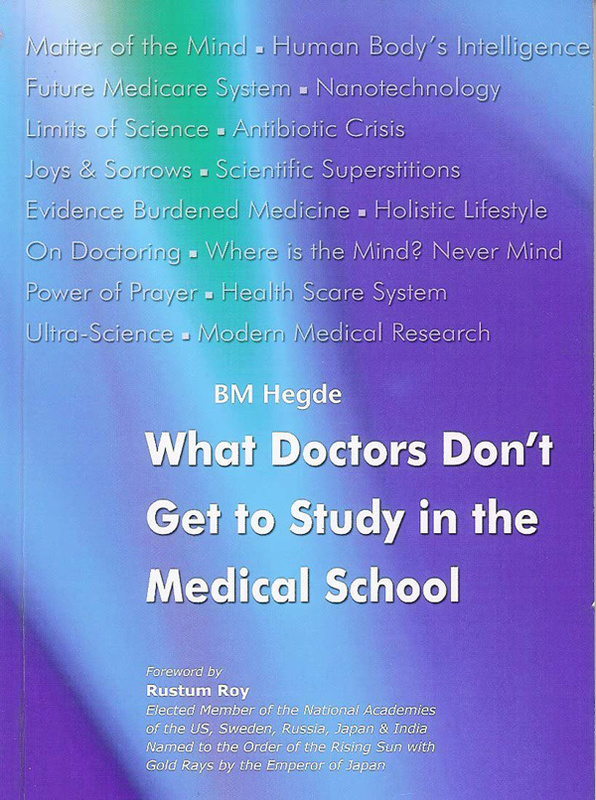 This book is written by Dr. B. M. Hegde. He is a visiting professor of Cardiology, the Middlesex Hospital Medical School, University of London; Affiliate Professor of Human Health, Northern Colorado University, retired Vice Chancellor, MAHE University, Manipal. I was most impressed … he spoke from the position of leadership in the hard-core western medicine world, and he spoke from his heart and head at the same time. 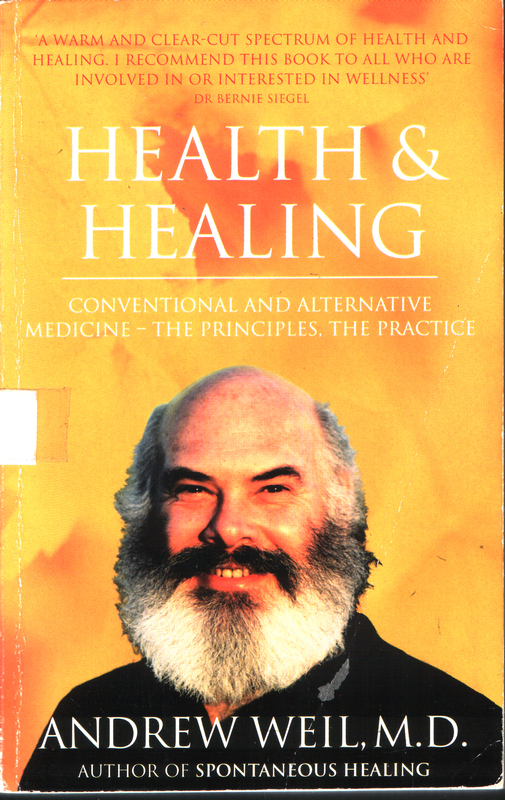 He is a senior, learned practitioner and researcher and administrator in that world of allopathic medicine. Hence what he says in constructive criticism of the world of current medical practice, carries weight … he called spades, “spades”. The thinking that doctors and hospitals are needed to keep a society healthy is plain rubbish. The USA healthcare system is a terminal patient in the “ICU”. Medical education needs drastic changes all over the world for doctors to be better equipped to deal with fellow human beings. The present education is disease orientated and not patient orientated. This must change first. Most of what we teach is based on statistical data that does not have a firm basis. Most of the science of medicine is not true science but statistical science. Modern medicine has been completely hijacked by technology and has been taken to the market place … resulting in medicine getting dehumanized and totally mechanized. Modern medicine has become top heavy with technology and consequently, is prohibitively expensive. Medical education, from day one in the medical schools is controlled by the money power of the multinational pharmaceutical giants and the technology manufacturers. The graph of cancer death has not shown a tendency to come down … hi-tech modern medicine is far from winning the war against cancer. Modern medicine, for all its breathtaking advances, seems to be slightly off balance like the Tower of Pisa. The short sighted modern reductionist scientific medicine looks at diseases from a narrow point of view …. would be beneficial in an emergency set up, but might even harm man in the long run. It is high time that many of the hi-tech early interventions are properly and meticulously audited in the field before being sold in the market. One would be shocked to know that this does not happen most of the time because of the hype and greed. Newer interventions are touted as the new avatar of life-saving-Gods in technological form and are let loose on gullible and demanding patients. It is better to remember the dictum … it is a crime to intervene in the healthy segment of the population with newer technology or untried drugs, with the fond hope and assurance of averting longer term danger when the latter interventions are not properly audited in that setting. As is the practice in modern medicine … we look for quick fix solutions to all our problems. Problems invariably have deep-rooted causes, which never get corrected with these quick fixes. However, the immediate solutions look good on the surface and deluded us temporarily. The malady recurs with greater intensity sooner than later. We still do not ponder to think of long lasting solutions to prevent sickness. This could only be done through proper education of the future generation. Health of the nation, as the health of an individual, could only be preserved through promotion of a disease-resisting immune system. Healing of any damage has to be ultimately done by the body’s immune system. Medicine, riding piggyback on technology, has gone to the market place in a big way. 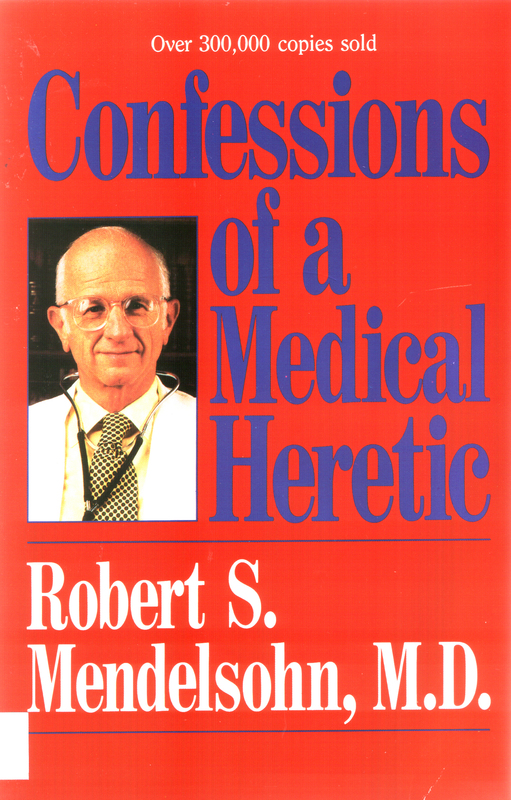 This has destroyed medical ethics, making most of us hypocrites swearing by the Hippocratic Oath! Technology has taken medicine to the market place, making the doctor a seller of technology and the patient a buyer. With the onset of the consumer movement in medicine, the time honoured doctor-patient relationship has all but vanished, resulting in all types of misery. In many areas, doctors have, in fact, become a menace to society! Even research is no longer the measure of honesty and purity. Doctors are being bought over by both drug companies and instrument manufacturers to sell their wares. Listening to the patient is the most difficult part of a doctor’s life. Learn to listen and you will succeed as a good doctor. Healing is an art. A good doctor should master the art of healing, never becoming so long in the western obsession with objectivity and its emphasis on reproducibility of experimentation. Empirical wisdom could help a good doctor to the same extent, if not more, than the so-called evidence-based medicine. All the improvements in human health has come from economic and sanitary improvements in human dwellings and not from the hi-tech medicine that is being touted as the panacea for all human ills. Many of us have this misconception that modern medicine has increased our life span. Far from it, very, very far. The truth is that modern medicine, if anything, has decreased our life span with many of the newer inventions and interventions! As modern medicine quick fixes are absolutely necessary in emergency situations, many of the chronic illnesses and minor illness syndromes either do not benefit from the top-heavy modern medical establishment, or could do well with very inexpensive but effective alternative systems of medicine. Money is not the criterion to judge you as a good doctor. Never try and make money in the sick room. Do not be in a hurry to make it big fast: no one has taken money with him while going at the end of life! The gratitude and the smile on the face of a grateful patient are priceless and give you true happiness. One must strive to earn such smiles in abundance. Let them be very clear in their mind that the profession of medicine is not for making money primarily, although money would automatically come. Medicine is a calling, which is very noble, and should never be debased to that of a moneymaking business. Modern medicine has become prohibitively expensive. It is going to be still more so with newer technology invading medical diagnosis and management more and more. Most of these technologies … did not live up to the expectations of their promoters and, in some instances, have even caused more harm than good. Each time we feel that some “things” have gone wrong with the human organs; we try and “do” something, until the patient gets better or he dies. The essence of medical teaching these days seems to be a “do it” and “fix it” attitude. Enormous “progress” have been made in the medical technological field. We live in an age of heart transplants, artificial hearts and kidneys, genetic engineering and even cloning. Daily we wage surgical and chemical warfare on diseases and the bill for it all is skyrocketing … bypass surgery is done more often to fill the coffers of hospitals and surgeons, rather than to help patients. Many studies in this field are being twisted, using all sorts of statistics, to show benefit to the patient, while in essence, the procedures are only helping the doctors and the industry. The more I learn about our profession the less faith I have in the truth of the Hippocratic Oath. People are after fame, mystery, falsehood, and false prestige and, of course, money. The man, who does genuine hard work, using his own special powers of thinking and comes up with an innovative idea rarely, if ever, gets his due credit. It is the crafty ones that could steal that wisdom and use it to perform “miracles” that get the limelight and all that goes with it. It is not the one whose genius discovers something that gets the limelight but the one who somehow or the other convinces the world about it gets all the benefits. That is life. Many doctors and most lay person have a misconception that hi-tech investigations are needed for arriving at a good diagnosis. The truth, however, is otherwise. The time of paternalism in medicine, where the doctor was considered omnipotent, has to be replaced by partnership in medicine, where the final outcome of any illness depends both on the doctor and the patient. The public must also be taught that doctors are not infallible and that they could also make mistakes. Scientists make the tall claim that science and scientific outlook have take mankind forward in the last one hundred odd years. Rational thinking and scientific outlook have enormous limitations. When you look beyond reason you get an insight into Nature’s functioning better. Nature has its reason always, but our reason cannot explore them many a time. There are a lot of things that one can only feel but cannot see and measure. It would be foolhardy to believe that science is the be-all and end-all of human wisdom. Very far from it. What we know is probably a very small fraction of what there is to know. The genuine rationalist is one who has understood the limitations of reason. Positive sciences, at best, could answer questions like “how” or “how much.” Positive sciences will never be able to answer the question “why.” The answer to the question “why” needs the knowledge of the limits of science. All the drug studies that we swear by have major errors. All the controlled studies are done not longer than 5 years before the drugs is let loose on the gullible public. Many of the unforeseen side effects occur only after 5 years — after the drug has been given to millions of people. Academic medicine seems to be on sale these days with doctors and researchers being offered lavish gifts by the companies. Even textbooks are written with drug company money! Final blow comes from researches trying to confuse the doctors with complicated statistical methods when the data are not convenient to their mentors. Whenever we are stuck with our controlled studies, many leaders take shelter under the umbrella of statistics. Statistics could be used as the whipping boy to get out of any inconvenient research situation that might not fit with our hypothesis, especially drug studies. The underlying problem is the large amount of money being sunk by drug lords in isolating the power molecule in the laboratory to begin with. When found to be useful in animals they go for human studies hoping to get similar results. If the results are not to their liking, instead of writing off that huge-sum, they get enough people to explain the variance with difficult statistical jargons to confuse the medical team. None of the medical interventions, including drug therapy, is without some danger lurking in the corner. While there is no pill for every ill, in the long run, there certainly is an ill waiting to strike after every pill. One, therefore, needs to weigh the pros and cons of those interventions to become an intelligible partner in one’s own medical care. Today medicine has become a business and the consumer, the patient, has to be an informed customer lest he/she should be led up the garden path to the misty world of hi-tech medicine. Progress is looking at the same thing from different angles. If we keep looking at something with the same angle … without questioning them at all, we would never progress. Change is progress and science is change. Let us allow people to think freely and not restrict thinking by our rigid narrow views of science. Condemning anything that does not fit in with our tunnel vision is not right. Wisdom does not belong to scientists only! Man is absolutely certain when he knows very little, with knowledge doubts increase ~ Goethe. Before society loses faith in doctors we have to change for the better. The popularity of complementary systems should not to be taken lightly, despite the fact that we shout from house tops day in and day out that complementary systems are not scientific, people in large numbers opt for those systems. They are not fools to do so. We should remember that a patient could live without we doctors but doctors cannot live without patients. Before we reach that stage let us act wisely and set our house in order. My frustrations with the educational system in the medical schools …. I could not change despite the fact that I had occupied almost all important teaching positions. I failed miserably and got frustrated as, at every level, I had to meet with very stiff opposition for change. Those who keep in touch with medical literature know my efforts in the last four decades. 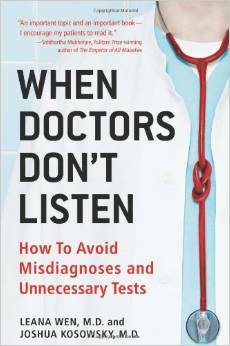 I hope this (book) achieves its goal of making doctors to think. Change comes only when one starts to think. In the present information-loaded medical education …. the student does not get stimulated to think and be creative. This is not encouraged and the student who tries to do that gets left out of the mainstream and has the prospect of being a loser. Doctors start believing in all that they are told and what they get to read. Most of what comes out in the plethora of biomedical journals is fake and doctored, but it is difficult to convince the readers about it. While I have been advocating that for more than two decades my friends have been labeling me a quack of the refined variety! With much respect, it is very hard to become a medical doctor, let alone become a “good” doctor. This is what it takes to be trained as a doctor in the US (in When doctors don’t listen by Leana Wen & Joshua Kosowsky). Medical training in the United States is a long and prescribed process. Since all medical schools require a bachelor’s degree future doctors must first complete four years of undergraduate work at a college or university (this is called premedical). They must score well in MCAT exam (Medical College Admissions Test). Medical education is 4 years; consisting of 2 years of preclinical years and 2 years of clinical years. On the day they graduate from medical schools, the students become a medical doctor, an “M.D.” but this M.D. alone does not entitle one to practise medicine. In the US, a new graduate must enter post graduate training called residency in order to be a licensed physician. During the final years of medical school students choose a field of specialization and upon graduation they enter residency training in that field. Residency ranges from 3 to 7 years, depending on the specialty. The first year of residency training is termed internship … the intern year is widely considered to be the most challenging. As the resident progresses through second year and beyond, the level of comfort with patient care increases. After completing residency, one is eligible to sit for additional exams to qualify as “Board Certified” in a particular specialty. Many doctors today (are) trained to think along a cookbook approach. We call it cookbook because it implies there is no deviation from the set recipe even as circumstances change. Cookbook medicine is easy to learn and relatively simple to practise. Doctors order more tests not because this is rationale based on patient in front of them, but because this has become the new “gold” standard in America, the “best” we have to offer … prescription pads fill up with tests, as if tests were cures in and of themselves. It is not difficult to see how the cost of health care adds up exponentially when doctors and patients both depend on tests, without questioning whether the extra tests are necessary, or worse yet, whether they may be harmful. Everyone gets trapped in an increasingly costly and increasingly dysfunctional system. Is this why Dr. Medelsohn made some hard comments below? Medical school does its best to turn smart students stupid, honest student corrupt and healthy students sick. The admissions people make sure the professors will get weak-willed, authority-abiding students to work on. They give them a curriculum that is absolutely meaningless as far as healing and health are concerned. Medicine is broken. 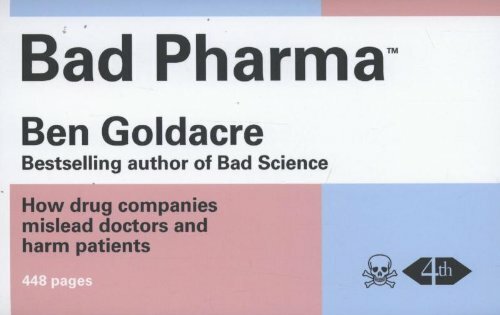 And I genuinely believe that if patients and the public ever fully understand what has been done to them – what doctors, academics and regulators have permitted – they will be angry. We like to imagine that medicine is based on evidence, and the results of fair tests. In reality, those tests are often profoundly flawed. Medicine is broken, because the evidence we use to make decisions is hopelessly and systematically distorted. I find (modern) medicine glaringly deficient in theory and philosophy of any sort … lack of any clear concept of health leading medical doctors to pay more attention to disease.